Branden Komm of the Reading Royals is the CCM ECHL Goaltender of the Week for Feb. 12-18. It is the second time in his career that he has received the weekly honor – and the fourth time a Reading netminder has received Goaltender of the Week honors this season. The 26-year-old posted shutouts in each of first two appearances for the Royals last week, after being acquired in a trade with Manchester. Komm turned aside 35 shots in an 8-0 win against Cincinnati on Friday and made 25 saves in a 6-0 victory against Wheeling on Sunday. 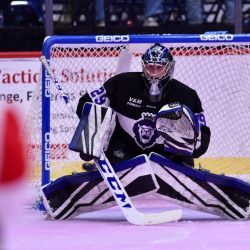 A native of Williamsville, N.Y., Komm has seen action in 20 games this season with Idaho, Quad City, Manchester and Reading, posting an overall record of 10-7-2 with two shutouts, a 2.60 goals-against average and a save percentage of .916. Komm has appeared in 94 career ECHL games with Evansville, Cincinnati, South Carolina, Idaho, Quad City, Manchester and Reading going 43-36-9 with six shutouts, a 2.73 goals-against average and a .914 save percentage. Prior to turning pro, he appeared in 115 career games over four seasons at Bentley University. Reading completes a four-game home stand vs. Worcester on Thurs., Feb. 22 at 7 p.m., featuring $10 tickets and a postgame photo and autograph session (Rieck’s Printing). Call 610-898-7825 for $10 tickets or visit royalshockey.com.